The present likeness of Barbara Villiers, the infamous mistress of Charles II, was painted by Nicholas Dixon, one of the leading court miniaturists or ‘limners’ working in post-Restoration England. Villiers was perhaps the most painted female sitter of the late seventeenth century, and the numerous portraits, prints, and copies of her image are testament to her place in the public’s imagination. Barbara Villiers first met Charles II when the Royalist court was in exile in the Low Countries. At the Restoration she was established as the King's favourite mistress, and, despite his marriage to Catherine of Braganza and the jealousy of other courtiers, she maintained a powerful influence at court. Five of her children were acknowledged as the King’s and by 1665 she was termed maitresse en titre. She was later ennobled as the Duchess of Cleveland in her own right. Nevertheless, royal attention, wealth and a degree of political power did not stop Villiers from engaging in other relationships. Amongst her various liaisons was one in 1668 with the tragic actor Charles Hart, presumably in retaliation for the King's growing attraction for actresses such as Nell Gwynn. By the early 1670s her influence had been entirely supplanted by Louise de Kéroualle, Duchess of Portsmouth. After this she spent some time in Paris before returning to England permanently in 1682. On the death of her first husband Roger, Earl of Castlemaine in 1705 she married Major-General Robert Fielding, a bigamist who was jailed for threatening and maltreating his wife. She died of dropsy at Chiswick on 9th October 1709. Nicholas Dixon succeeded the short tenure held by Richard Gibson, following the long career of Samuel Cooper, as king’s limner to Charles II in 1673. Despite his obscure origins and apparent intermittent poverty (he is documented as paying the ‘poor rate’ from his London home in the 1670s) he belongs, in style and quality, to the small, distinctive circle of Restoration court miniaturists. 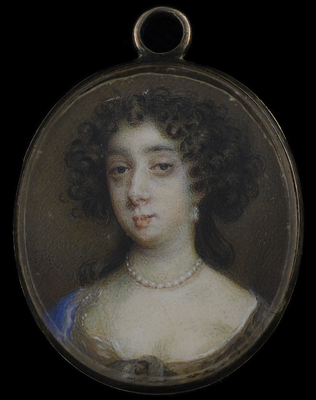 The distinctive style of the hair, curled and worn up in bunches at the side, is dateable to the mid-1670s and was probably therefore painted just prior to Villiers’ departure to Paris in March 1676, where she remained until 1682. The head-type bears a striking similarity to Lely’s earlier portrait of c.1666 of Villiers standing with her hand resting on a sword [National Portrait Gallery, London, NPG 387], and it is quite possible, given Villiers’ fall from favour by this point, that Dixon had to make do with the Lely portrait-type as his reference, albeit updating the miniature with a more ‘of the moment’ hairstyle.